Two firsts last night—the first time we read from Gotta Keep on Tryin’. And the first time we attempted to use the digital camera. Reading was a success. We participated in the Genesis Festival, the last event of the year for Crossroads Theater in New Brunswick, N.J.. Crossroads, the Tony Award winning regional theater which is dedicated (primarily) to portraying the African American experience, has been like home for us since the beginning, so it was a great place for us to try our new book wings. Writing is one thing, but the first time the words from a book slide across our tongues and out of our mouths—it’s scary and thrilling—like one of those roller coasters that makes you scream, but it feels good when you get off (DG gets this metaphor more than VDB. She hates roller coasters). It’s like saying the words aloud makes them even more real than seeing them typeset on a page for the first time (which is also really scary). It means the story is out of our heads and living a life of its own. The digital camera thing needs some work. Yes, we’re behind the times. We’ve been meaning to switch to digital so we can share pictures easily—oh, since Far From The Tree, but we jumped in last night. Or more accurately, figured out the camera enough to hand it to someone else and ask them to take pictures for us. Well, we really got some pictures. Four of them—then it said our memory card was full. Three pics were too dark, but the good news is we got one, and we actually downloaded it and we’re sharing it with you. The camera is supposed to take video too. Guess we’ve got a ways to go on that, but we’re moving in the right direction. Oh yeah--the reading went very well. 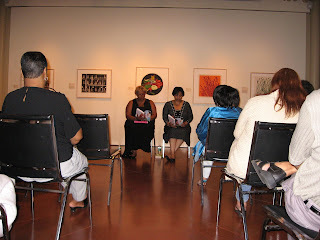 The audience liked what they heard from the new book! As we say here in the South, "where y'all been?" It's been a 3 years since "Better Than I Know Myself and I'm so, so so excited about the new book! I really love your books because you write about what you are, BFF's. Will we get a synopsis of "Gotta Keep On tryin'" soon?